Ideal for tables, shelving units, cabinets and more. 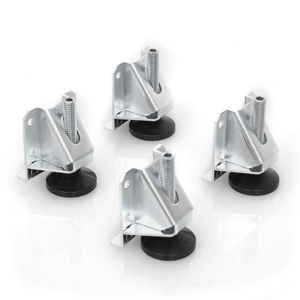 The Heavy Duty Leg Levelers have an L-shaped mounting bracket that offers better support and stability than standard levelers. The Heavy Duty plastic foot measures 1-5/16" in diameter. The levelers are made from a heavy gauge, plated steel. Using all four levelers provides you with a load capacity of approximately 600 lbs. Load capacity of approximately 600 lbs.